A writer will sometimes swim into my ken like a...like a duck swimming through an open window. 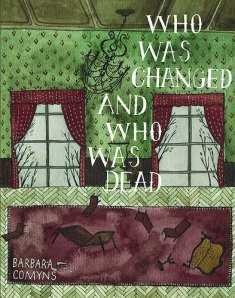 A few of Barbara Comyns’ books had been paddling about the periphery of my attention during some recent bookstore shopping, and I felt particularly attracted by one title, Who Was Changed and Who Was Dead. If you too happen to have picked up this book, you’ll know that the first line indeed features ducks swimming through open windows, by way of casually introducing both the flood that starts the story and the affected home around which it revolves. The flood is hardly the only misfortune to befall the Willoweed family and the small Warwickshire community in which they live. Before Who Was Changed and Who Was Dead comes to an end, other grave and not so grave challenges have impacted the family and the town, leaving some dead, and some, well, changed. I’ve already given away enough by mentioning the flood, so you’ll have to read the book yourself if morbid curiosity gets the best of you about what other afflictions lie in store. But even were I to recount the entire, short plot, you’d probably still be unprepared for Comyns herself, with her particular blend of sensitive, playful characterization, dark humor, and blithe tone of warm and genteel dread. Plus, she’s able to write sentences that are as original and resistant to imitation as the phrasing in a Frank Sinatra song. This is a quite memorable a cast of characters for such a short novel. Each teeters on caricature - until he or she isn’t. Grandmother Willoweed comes across as a slightly more vicious, animated and purposefully hard-of-hearing version of Caroline Blackwood’s marvelous creation, Great Granny Webster. The father in the family, Ebin Willoweed, is an amiably obtuse but kind-hearted fatherly type. The story’s most central character, the eldest Willoweed daughter Emma Willoweed, through whom much of the novel’s gothic actions are filtered, provides a marginally heroic presence, despite possessing a kind of naturalistic fatalism: “I shall be just me, and nothing will happen at all.” A great cast of more minor characters, from Old Ives the gardener to Doctor Hatt the town physician, fill out the queer community that Comyns creates in her village microcosm. Despite Comyn’s portrayal of her characters with a notable lack of flattery that almost borders on cynicism, it’s a kind of cynicism so mild and warm-hearted as to deserve some kinder appellation. For kicks, I’ll invent one, and call it “cyncretism” – a striking ability to reconcile radically opposing elements in a radiant and tenderly cynical manner. Actually, Comyns does such a stellar job of hiding this cynicism under her magnanimous vision that she manages to emulsify it into the overall recipe. You end up believing that Comyns’ hint of cynicism is a bit of a put-on; she stands out as a writer of unusual depth and generosity of feeling, capable of plumbing ordinary and extraordinary horrors while spreading much love and affection over the moral and emotional faults of her characters. Comyns’ novel has elements that would be horrifying (or more horrifying, I should say) were they not overlaid with this kindly sort of pastoral acceptance. Imagine one of those lovely, childhood-centered stories of Katherine Mansfield such as “Prelude” or “At the Bay” in a mash-up with Edward Gorey’s Gashlycrumb Tinies and you’ll get some idea of Comyns’ tone (it’s a very short jump from Comyns’ Willoweed family to Gorey’s Willowdale handcar). Yes, there are ducks contentedly quacking their merry way around flooded drawing rooms, but there are also drowned kittens, pigs with their throats sliced open, a scene involving a murderous angry mob so terrible that it might have given Shirley Jackson the shivers, and various cruelties playing along the whole keyboard of impression, in both major and minor keys (according to the preface by Brian Evans, not everyone initially found this placid juxtaposition of bucolic family life and Boschian horror appealing; the book was banned in Ireland when it came out in 1954). Who Was Changed and Who Was Dead is a small novel that feels much larger than it is. It’s a story of exactly what the title (borrowed from Longfellow) suggests it is, but also an account of how people respond to calamity, both natural and human (including, perhaps foremost, the calamity of one’s own family). One senses in its geographical localism a tug on connecting threads that extend far out around the globe. The smallest tragedies recapitulate the largest ones, as the town baker Horace Emblyn seems to realize after a batch of ergot-contaminated rye bread gets out into the community: “He noticed a trap with a crushed mouse spread upon it. There was a bead of blood upon its mouth and he turned away for a moment and then forced himself to look at it. Who was he to turn away from a murdered mouse, when he was responsible for so many deaths?” Reading Comyns’ novel, my mind drifted to other writers and books, from the quirky characters of Jane Bowles to the darkly funny humor of Evelyn Waugh and Beryl Bainbridge. Curiously, though, no work came to my mind more frequently than Albert Camus’ The Plague, despite these two books being about as different from one another in tone and style as two books could be. There’s a deceptive lightness to Comyns that overlies a serious moral core: how does one live a good life? How should one react in the face of disaster or cruelty? Camus laid out a set of memorable characters who represented various responses to these questions. Comyns inverts Camus; no one could ever mistake her characters for representations, as they are first and foremost fully-fleshed, idiosyncratic and extraordinary ordinary people, and only afterwards the decisions they make. From the little I know about Comyns, I apparently have ten more of her novels to go. On the strength of Who Was Changed and Who Was Dead, I’m eagerly looking forward to reading every one. Hadn't heard of this author before, Scott, but I'll have to keep her in mind for a look at her available titles the next time I'm in a bookstore. Of the many things I enjoyed about your post, I think I was most tickled by the part where you said Comyns reminded you of Camus even though she's really nothing like Camus! I know exactly what you mean but am often perplexed when such "jarring" comparisons occur to me in my own readings. Weird. Richard - One of the mysteries of reading, but it happens to me all the time: some ostensibly unrelated author or work will keep coming to mind while I'm reading another author's book. Obviously there are often reasons for this, but it's an enjoyable sort of game, isn't it, to keep one's antennae attuned to the seemingly more haphazard thoughts and try to divine how they connect?